Versatile cutter with adjustable depth gauge and staple remover Heavy-duty packaging cutter is one the most versatile cutters made by OLFA and a classic example of value-added features often found in our cutters. Features an adjustable depth gauge, built-in staple remover, and a one-of-a-kind sturdy flat cutting base for stability and perfect 90º edge. Perfect for cutting drop ceiling tiles. Also includes a heavy-duty stainless steel blade channel that holds blade tight. Blade made from high quality carbon tool steel is produced using OLFA's precise multi-step production process for unparalleled sharpness and superior edge retention. 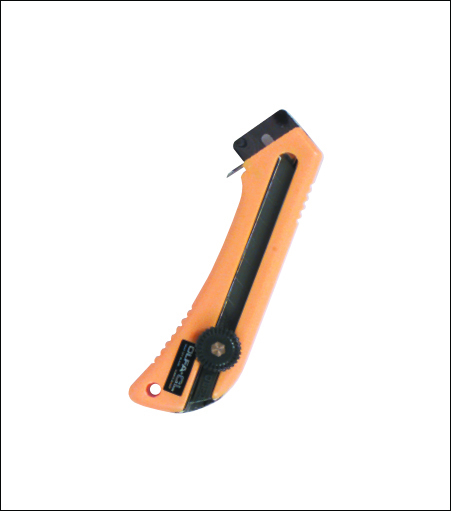 Long lasting durable snap-off blade - a new sharp edge with each snap.